Periodic table posters in science labs need to be updated. 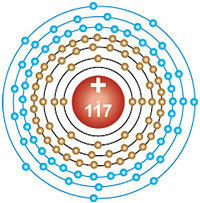 Scientists from Russia and the US have synthesized a super heavy radioactive element with atomic number 117. They have named it ununseptium or Uus, until the International Union of Pure and Applied Chemistry decides on a name. Uus is the immediate decay product of the heaviest radioactive element 118, or ununoctium. Understanding its properties may take some time because Uus remains stable only for 78 milliseconds. The scientists said synthesizing the element is a major step towards discovering stable superheavy elements that could last for a very long time, even approaching billions of years. Except plutonium and neptunium, none of the elements beyond atomic number 92 (uranium) occur naturally. 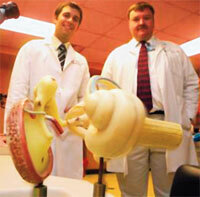 US scientists have upgraded the conventional cochlear implant, a hearing aid. The upgraded device has more electrodes and a thinner, more flexible wire that can be inserted further into the cochlea, the inner ear where the auditory nerves are bundled. A team of scientists from the Medical College of Georgia and the Georgia Institute of Technology said more the electrodes on the nerves, the better the sound. The device would thus offer an improved sound resolution. Since the snail-shaped cochlea is difficult to access, the thinner wire can easily pass through the tube, lowering the risk of damaging the ear during implantation. Flowering plants keep the surroundings pleasant and wet compared to non-flowering plants. In fact, in the Amazon rainforest replacing flowering plants with nonflowering varieties would reduce 80 per cent of the area that always remains covered by wet rainforests. Scientists from the University of Chicago in USA said high leaf-vein density of flowering plants is responsible for this. High vein density means better absorption of CO2, a greenhouse gas, and more transpiration to herald the rain, they said. The popular belief is hens living outdoors with plenty of fresh air and sunshine, and foraging on a grass range lay eggs that are healthier than those laid by caged hens. Not necessarily. Scientists have found freerange eggs in Taiwan contained 5.7 times more carcinogens like polychlorinated dibenzodioxins and polychlorinated dibenzofurans than regular eggs. The chemicals are mostly released by municipal incinerators in Taiwan. Free-range hens get exposed to higher levels of environmental pollutants, the scientists cautioned. Astronomers recently captured the image of a star just as it was being born out of the surrounding gas and dust in the galaxy. It was the most detailed glimpse of the initial stage of star formation till date, said the group of astronomers from USA and Germany. They observed that the future star, L1448-IRS2E, was ejecting streams of high-velocity gas from its centre, which means some preliminary mass has already formed. They took the image using NASA’s Spitzer Space Telescope. It is, however, difficult to see the mass in the image because stars emit very little light in the formation phase. Located 800 light-years away from the Earth, in our own Milky Way galaxy, L1448- IRS2E is a few thousand years old. The group plans to use advanced space telescope to observe more stars in the intermediate stages of formation to understand how they grow and evolve. Sunlight is an abundant source of energy. 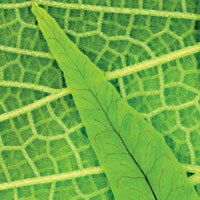 But conventional solar cells are able to convert just 31 per cent of the light into power. Most of the sunlight that falls on solar cells gets lost as radiation and heat before it can be trapped by the silicon semiconductor. 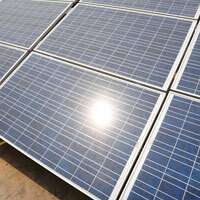 Scientists at University of Texas in USA said the efficiency of solar cells can be improved by reducing the loss of energy. They have found replacing the silicon semiconductor with lead selenide reduces the loss of energy through reflection and doubles the efficiency of solar cells. Coral reefs are struggling with ocean acidification, higher water temperatures and destruction caused by humans. 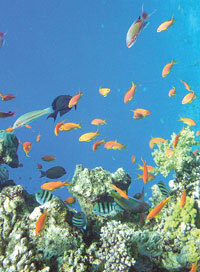 To save these ecosystems, conservationists mostly focus on the centres of reefs where coral diversity and density is high. A group of American and Australian scientists has urged the focus needs to be changed. They studied the Caribbean reefs and observed corals on the outer edges of reefs spur innovative evolution to help a reef adapt to more acidic, more polluted and warmer oceans. Conservationists should expand their strategies to the outskirts of the coral ecosystem where the evolution is happening, they said. About 400 millions of litres of oil has gushed into the Gulf of Mexico since April, and along with it a large amount of arsenic. The toxic chemical is present in fossil fuel. Arsenic also occurs naturally in the ocean water. But seafloor sediments cleanse it by bonding with arsenic and subsequently burying it under new layers of sediments. This keeps the levels of naturally occurring arsenic low. Researchers from the Imperial College London have discovered oil spills can clog up the sediments, preventing them from bonding with arsenic. This causes arsenic levels in seawater to rise, contaminate the marine ecosystem and eventually enter the food chain. 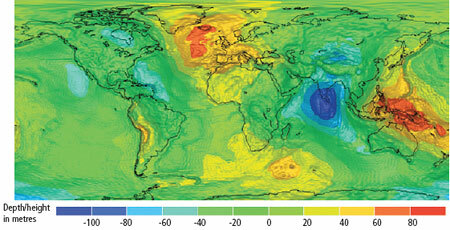 Using initial data provided by the gravitytracking satellite GOCE, European scientists prepared a map that traces the Earth’s gravity. The map shows how Earth would look like if it was covered with an ocean dictated only by its gravity, which does not exert an equal force everywhere. The map will help scientists better understand Earth’s internal structure and measure ocean circulation, sea-level change and ice dynamics.